#28 - TL;DR: California is Awesome. Motto: Beverly Hills- that's where I want to be. I'm going to keep this as short as possible. There is a LOT to cover if I want to cover everything, so I should keep rambling to a minimum if I can. Rambling. Ram Bling. Weird. Minimum. Mini Mum. Strange. I can. iCan. Okay now you're just messing with me. I already wrote up my Top 5. It's a photo edition Top 5. It's also a Top 15. I couldn't whittle down my trip into just 5 pictures. Even those 15 pictures don't begin to portray what a fun-packed adventure I had. I'll probably sneak a couple more here in the body of the column, just to be sneaky. Side note: My Pandora is rocking pretty hard right now. My station named The Greatest Station Ever is pretty much just that. It's been basically a week since the last time I updated. This would normally mean I was a little busy, I had to work, I was away from the computer, or I just wasn't feeling particularly inspired. This time, though, it meant that I was just having an awesome week and I didn't want to remove myself from the moment at any point in time during said week. Let me consult my 5 year journal to see what happened this week. There have been 4 major events worth writing about since my last update. First, I spent time with friends. Saw Jon in Emporia. We shopped around and hung out at his new place. Saw my ex-residents in Lawrence. We watched movies and caught up. Also successfully made a taser out of a disposable camera without injuring anyone. Motto: You know what I've noticed? Nobody panics when things go "according to plan." Even if the plan is horrifying! The motto is a quote. Name the movie and get a prize (it's one of those fake internet prizes, so don't get your hopes up). The quote later on will not be a motto, though. Don't anticipate any sort of reciprocity there. It isn't happening. Today I crossed something off my to-do list. Something that has been idling on there since before I graduated. If you've read the title of this post you probably already figured this out, but I've got that whole "job" situation lined out. 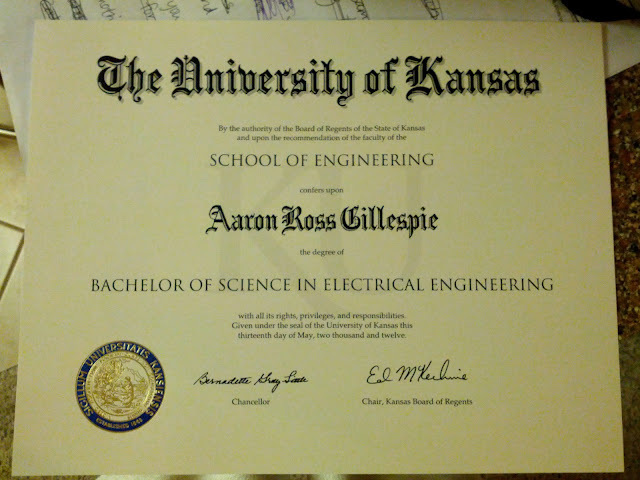 Unless something weird happens, I will be starting work in September as a full-blown no foolin' Electrical Engineer. If you really care where, you can ask me in person. If you don't know me in person, then I don't care to tell you where I work. See how that works? The first segment of this column was written 4 days ago. Until further notice this is effectively an old post within a new post. Remember that desk I was talking about during my last column? Check this out. You know it looks good. The cables behind the monitor are there only for the three lamps. 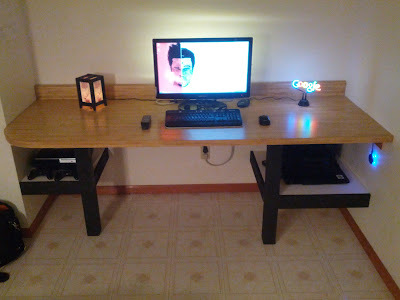 The middle lamp is a strip light behind the monitor. Got it at Ikea. Produces a nice effect. I have a power strip back there that only the lamps are plugged into. I leave them on all the time, just turn off the strip when I'm not around. That way, one switch hits three lamps. Pretty smart? You know it is. Actually that's so good, let's have another look at it. Alright alright, enough about the desk. Consider this further notice. We are officially back to me writing about the present day (although that desk thing is still pretty new and quite spiffy). I am officially back home. I'm not sure for how long, though. I am here until after Melissa gets home and I can do some soul searching. That is also dependent on the whole job situation, which I expect to be set in stone by this time next week. In the meantime, I am going to do a little rearranging of my living space here. This started last night when I disassembled the fooseball table and freed up that corner. 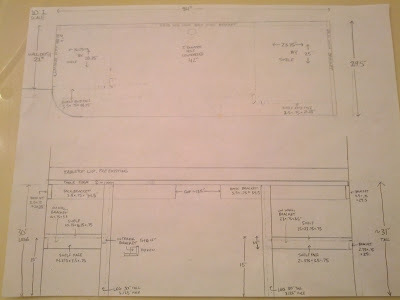 I drew up a desk for the new nook. With watchful pointers from the old man, I cut and crafted my original design to near-perfection. The biggest fitting/design/construction error I've seen is a 1/8th inch gap in a cosmetic board. Oh, and my spraypaint job sucked. I consider this practice. Practice for designing and building useful things for the rest of my life. It's not very sophisticated, but it's something. Motto: Don't eat an apple a day. Doctor visits are necessary. First, I started writing in a "5 Year Journal". It has 365 pages. Each pages is separated into fifths. One fifth for each year. This way, you can see what you wrote the previous year(s) on your next go around. This is the first way I've added additional life documentation. This journal idea (and the journal) was given to me by Sally (who will come up later).